Good bye, Acura TLX. You were in many respects a very fine car. You were fairly attractive and you had lots of bells and whistles. You were very peppy, handled well and had a very good ride for a small car. But there were issues also. Leaving Sandi stranded a couple of times was not a good thing. Also, we underestimated just how small you were. Getting just two sets of golf clubs into the trunk was a challenge. So even though we still had 6 months left on the lease, we bid you farewell. Now begins the ordeal. Unless you have a pile of cash and a car you can easily trade in, you're going to be doing a lot of running around. First we had to determine the procedure for turning in a lease which actually turned out to be fairly easy. It was the long drive to the dealer that was a pain. Because this is tax season, Sandi was busy so I had to impose on my son to follow me to south Norwalk, wait around, then drive me home. That pretty much killed the morning. Then there was a problem transferring the plates. The leasing dealer said we couldn't use them because they didn't belong to us. The new car dealer said baloney. Of course we can use them. We went with the second opinion and will now wait to see how the town screws up everything at tax time. Next is arranging the financing. Again, thanks to Waterbury Teachers Federal Credit Union, that procedure was pretty easy too. It just takes time. Gathering information, making the trip to the closing, etc. Then it was necessary to get a bank check for the amount we were putting down. All easy tasks but time consuming. Thanks to my son who is also our insurance agent, everything was handled well on that end. It's amazing how many documents you sign when you buy a car. It's closing on a house-well, maybe not quite but close. So anyway, we are now the proud owners of a new Jeep Grand Cherokee Ltd. I still have my trusty pickup. 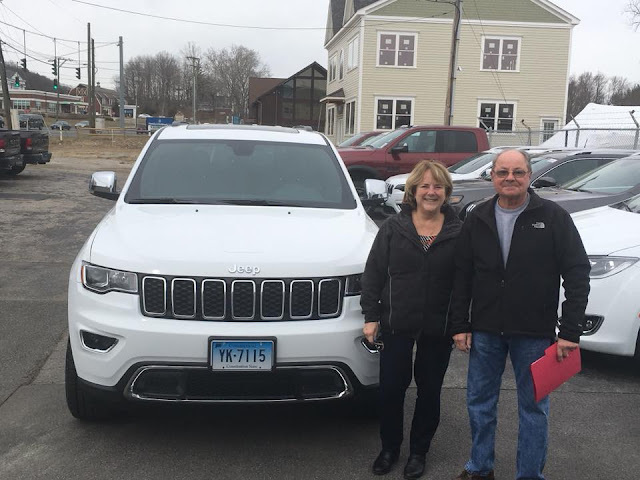 By the way, Wetmore's Jeep and Dodge in New Milford was fantastic. Good people, good service and great cars. A win win win!